Since the moment children are born, parents do their best to keep their kids safe. This includes safety on the road. Today, kids ride in specially designed car seats and booster seats for years. Their parents drive carefully with them in the car and teach them about auto safety at a young age. Then, the day comes when kids themselves become responsible for their own safety on the road. After their 16th birthday, kids are legally allowed to drive alone. While this is an exciting time for the young people and often helpful to their parents, it is also a dangerous period. Sixteen-year-old drivers have the highest crash rates among all drivers. One in five will be involved in an accident within their first year of driving. And the statistics for older teens are concerning as well. Car accidents are the leading cause of death for American teens. The Centers for Disease Control and Prevention (CDC) finds that six young people ages 16 to 19 die every day as a result of an automobile crash. Why Are Teens Such High-Risk Drivers? Per mile driven, teenaged drivers are three times more likely than older drivers to be involved in a crash. There are many factors that contribute to this fact. First, their inexperience behind the wheel can prevent them from recognizing or properly reacting to changing road conditions. Also, developmentally, teenagers feel invincible, as if nothing bad can happen to them. They may engage in risky behaviors, including risky behaviors behind the wheel of a car. Underestimate or fail to recognize dangerous situations. Talk on a cell phone while driving. Remain silent if they are a passenger in a car with an erratic or unsafe driver. Additionally, even though teens are less likely to drink and drive than older drivers, when they do, the results are frequently more devastating. Alcohol use played a role in 17 percent of fatal teen crashes, despite the fact that teens are not legally allowed to drink. What Can Be Done to Encourage Teen Driver Safety? Texting or talking on a phone. 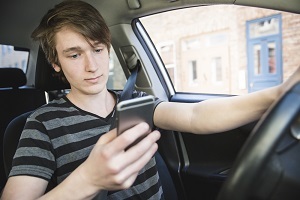 Teens are grouped with the highest rate of distracted driving because of a cell phone. Traveling with extra passengers. According to the NHTSA, teens are 2.5 times more likely to take risks when driving with a teenaged passenger and three times more likely with multiple passengers. Speeding. The NHTSA states that speeding was a factor in 42 percent of fatal crashes involving teens in 2013. While it is a common occurrence, speeding is against the law and increases the likelihood of being involved in an accident. One significant safety tool that is often overlooked is the seat belt. The CDC states that of all the teens killed in car crashes in 2013, more than half were not obeying Georgia's seat belt laws. So, when teens are involved in an accident, they suffer more serious injuries. The CDC also states that seatbelt use can reduce crash-related injuries and deaths by about half. The National Highway Traffic Safety Administration (NHTSA) claims that despite state and national efforts at educating teens about the importance of buckling up, seat belt use among young drivers was the lowest of any group. For parents of teenage drivers and for everyone who shares the road, safety should be the number one priority. Teen drivers are not only placing their own lives at risk when they engage in dangerous driving behaviors, but the lives of other drivers as well. The CDC encourages parents to talk to their kids about all these safety issues and institute a safe driving agreement. State your expectations clearly in writing and have consequences if the agreement is broken. Despite everyone’s best efforts, mistakes are often made and accidents happen. If you or someone you love has suffered injuries in a car accident, you may be eligible to file a claim. Call the experienced car accident attorneys at Rechtman & Spevak today at 888-522-7798 to discuss your unique case and learn more about your rights under Georgia law.